Anyone who has spent a fair amount of time in the Southern United States will come away with a few steadfast facts. Despite our friendly demeanor and a relatively relaxed approach to life, down here people take some things quite seriously. Religion, hunting, and college sports are just a few examples. While those three categories are each important in their own way, there is another topic on which we southerners will wax poetic for hours on end and that is food, in particular BBQ. Even here in central Mississippi, a relative BBQ desert, you can ask any man, woman, or child and they will tell you which BBQ restaurant serves the best que. In many cases, due to our geographic proximity, the same man, woman, or child has a favorite Memphis destination for BBQ. From the dry rub ribs of Charlie Vergos' Rendezvous to the BBQ nachos of Germantown Commissary, there are fans in every camp. 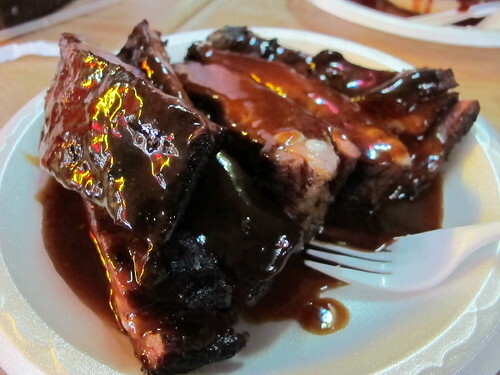 While I may have my own preconceptions, I’m still feeling my way around the world of Memphis bbq. My family never made the weekend trips to Memphis; New Orleans, Houston, or Dallas was always our destination. Having gone to college in D.C., I never made collegiate road trips from Oxford to Memphis or even Starkville to Tuscaloosa. So, a few years ago, I decided to start with a clean slate. 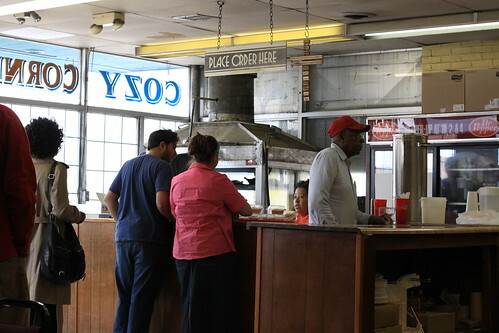 So far I’ve paid a visit to Germantown Commissary, the original Corky’s, and both Neely’s and Neely’s Interstate BBQ. With my old friend Sam coming along for the ride, I decided to expand my Memphis bbq experience and pay a visit to the Cozy Corner Restaurant. If you’re expecting glitz and glamor when you pull up to the Cozy Corner, you’ll be sorely disappointed. 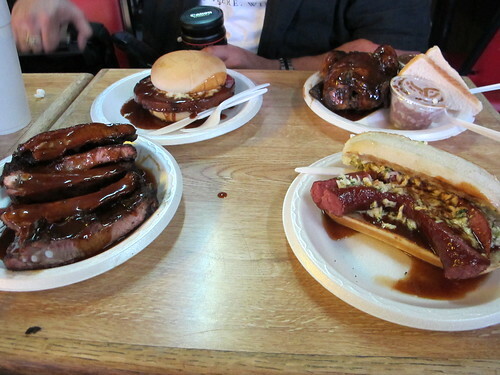 Cozy Corner is the epitome of a humble BBQ joint. The sign outside is faded and rusted from years of southern seasons. But any misconceptions about outward appearances were dismissed when we caught the sweet perfume of smoke in the air. Inside, it’s much the same vein. You can tell there are some years on the wood paneling, but what matters is the pit. I’ve heard it described as a Chicago style pit, which, I think, means the heat source is farther away from the meat than most normal pits. 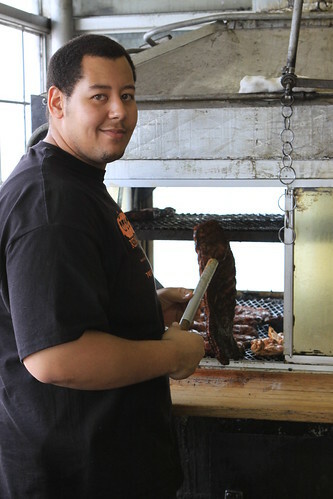 Regardless, fed by charcoal and manned by smiling faces, the pit at Cozy Corner is a welcoming site. After placing an order for a small army’s worth of food, Sam and I found a table amongst the sea of Naugahyde booths and chairs. Soon enough, our lunch began to flood the table. With the Cornish hen, the bologna sandwich, sausage sandwich, and the ribs, we did our best to hit all the must eats of the Cozy Corner menu. There’s no better place to start than with the six rib plate. 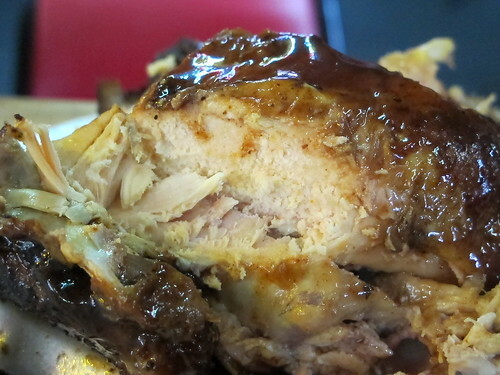 Doused in Cozy Corner’s hot BBQ sauce, this is the reason we drove to Memphis. 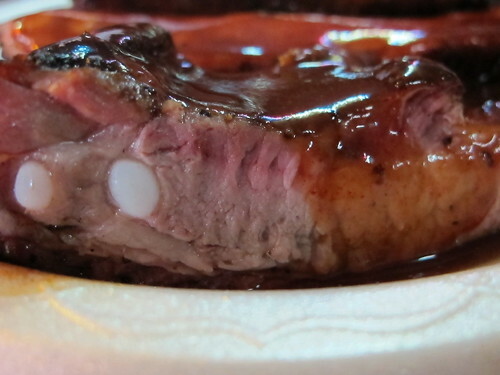 Tinged with the rosy hue of smoke, these ribs were perfectly cooked; each bite took the slightest amount of effort but we were rewarded with smoky meat that was only enhanced by the three pronged attack of the BBQ sauce. While the sweet, vinegar laden spice of the hot BBQ sauce was in full effect on the ribs, it was a different story with the sausage sandwich. 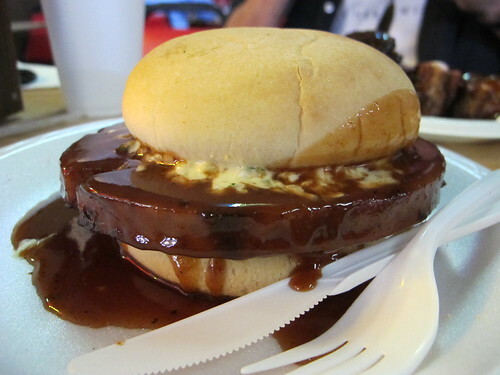 At its core, this was a simple, pork sausage with a decent snap to the casing, but it was topped with BBQ sauce and cole slaw. 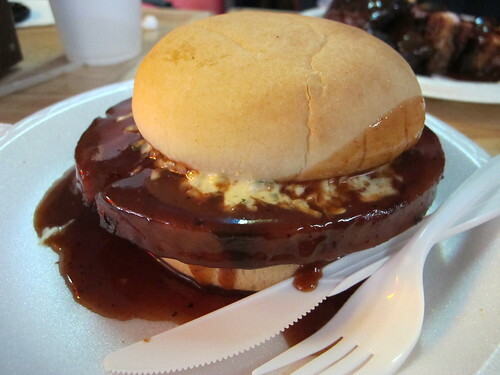 When combined with the slaw, the lingering heat of the BBQ sauce was assuaged and the sweeter notes came forward. 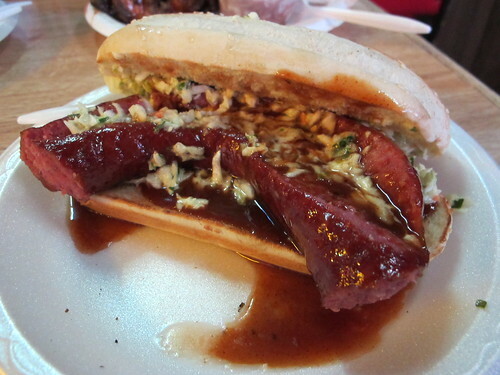 All together, this mixture of sauce, cole slaw, and casing wrapped meat elevated an average sausage to a whole new level. 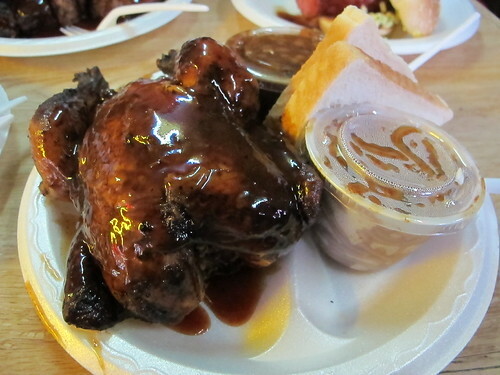 Although I had heard great things about the ribs at Cozy Corner, it was their bologna sandwich and Cornish hen that seemed to garner all the recognition. I still have vivid memories of my grandmother frying paper thin slices of bologna in a skillet so I was halfway expecting a pile of luncheon meat on a bun. This preconception left me unprepared for the bologna sandwich that was brought to our table. You never see a slice of bologna like this in the wild; to many people, bologna doesn’t exist outside of the world of prepackaged, pre-sliced deli meats. This was different, a whole new way to look at the oft maligned emulsified meat. With the silky tenderness of the bologna, the creaminess of the slaw, and the spiciness of the BBQ sauce, this was a novel idea and more than just a big slice of bologna. Glistening with a layer of freshly applied BBQ lacquer, the Cornish game hen was a sight to behold. To be frank, I usually shy away from chicken when it comes to BBQ. All too often it’s the same scenario, dry, chalky white meat, gummy, insipid dark meat, and a skin that has more in common with congealed phlegm than a decent source of fat and flavor. While the tiny dark meat section of diminutive tiny bird was beautifully juicy and chock full of smoky goodness, the white meat was just what I feared. This Cornish hen, this unique item was both what I was hoping for and what I was dreading. 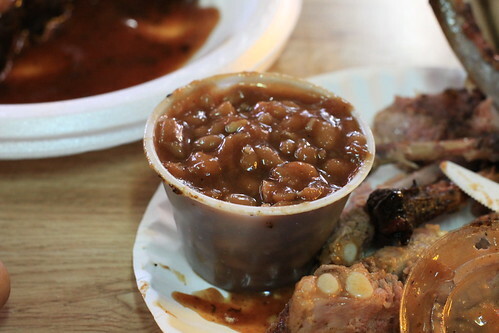 Of course, I can’t forget the BBQ staple, baked beans. With tender beans, a sweet but not overpowering sauce, and the occasional crunch of celery, Cozy Corner knows how to make a fine batch of baked beans. While I was quite happy with the peppery sauce, I was let down by the lack of pork pieces in the container. 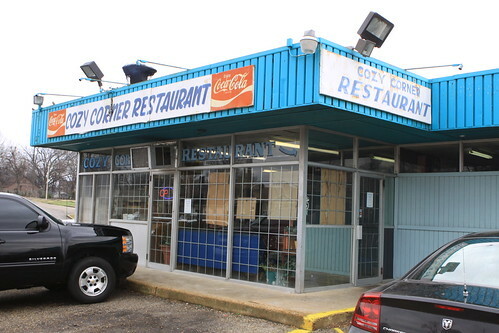 I had originally planned to eat at Cozy Corner a few years ago when Jennifer, Aaron, and I were making a whirlwind tour of a few Memphis BBQ hotspots. Unfortunately that tour occurred on a Sunday and Cozy Corner is only open Tuesday through Saturday. Well, two years and several hundred miles later, I can happily say that Cozy Corner is worth the effort. While I may have been disappointed in the Cornish hen, the charcoal cooked ribs and the still tingling on my lips sauce more than make up for the laggards. I may still have a long way to go on my rounds through the Memphis BBQ hotspots, but Cozy Corner is near the top of my list. Sorry your cornish hen didn't live up to billing; try it again sometime. I was there a week ago Saturday for everything you had but the bologna. The ribs and shoulder were better than I remembered, I was slightly disappointed but still happy with the Cornish hen, and the beans were as always really good. As I keep saying, you should try the Payne's on Lamar. -I'll make sure to try the cornish hen the again, and don't worry, I'll make it Payne's. It was just a matter of compromise that day. 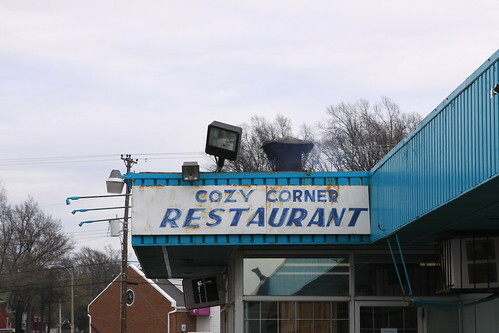 We decided to split lunch between bbq and fried chicken and I've had Cozy Corner on my to try list for a few years. By the way, did you see Payne's on the Serious Eats regional bbq guide? Not sure whether I saw the Serious Eats bbq guide. I think so. I was reading you list of BBQ spots and was wondering why Payne's wasn't on the list and then I got to the comments. NMC's younger brother was the one that introduced me to Payne's years ago. 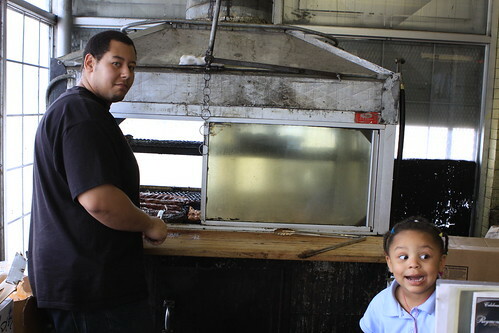 It is the home of the unpretentious REAL Memphis BBQ. I make it a point to go there every time I'm in Memphis. Love Cozy Corner, love Payne's and love the BBQ Shop. Dry ribs are usually the best in town.